We had to do 12 boulders in the selection round and 3 in the finals. The selections were very nice routes. I discussed them together with Magalie, Claudine and Laure. 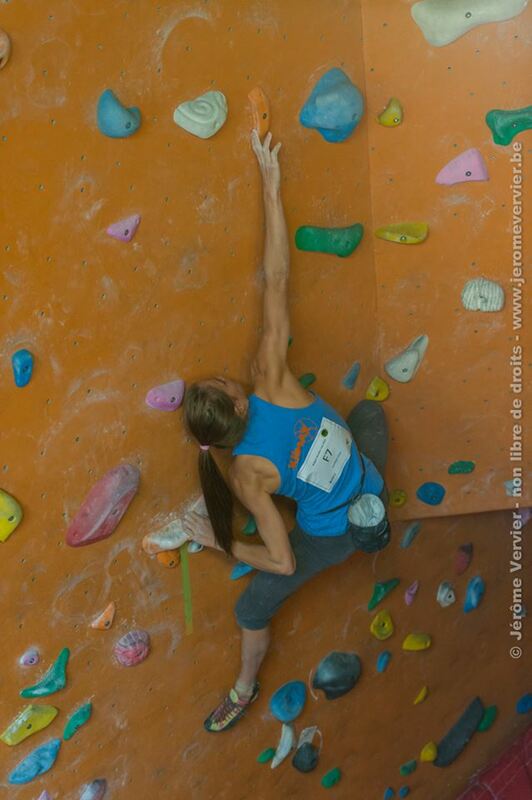 Boulder problem number 11 was a route on the vertical wall, with a dyno. Looking at it, I had the feeling that I could stick the jug, but I wasn’t sure if I could make the next move high up to a very narrow hold. My mama told me I had to think positively while visualising how I had to do the next moves. So I solved ten problems from the first attempt. When I tried number 10, I fell because I was too tall, but I got it in the second attempt. Then I used my 5 attempts on number 12 which was a terrible boulder problem. The route was too hard for girls, so nobody could stick it, we didn’t even reach the bonus. The moves were too far and they required too much power. After the selections, I was in first place. Elfe, Magalie, Laure, Liesbeth, Héloïse and I were in the finals. In the isolation zone, the boy group warmed up in our number 12. Only two of them could stay into it à vue till the last move. The girls couldn’t stick the first holds and the boys couldn’t stick the last hold. We warmed up and soon we had to rest. The left part of the boulder gym was transformed into the isolation zone. The lights were out in that part and it was split up in two sections. We started in one section and then one by one we climbed and went into the other section. The first boulder was an orange route on an island at the left side of the gym. This problem wasn’t so difficult and five of us finished it in the first attempt. The second boulder was in the middle of the gym to the right of the island. It was a black route and I did it in the first attempt and the others in second or first or not. Last but not least, an orange route on the right side of the boulder gym. I reached the bonus in the first attempt, but fell in the last move where I had to push myself up on the wall. I tried a second time, but fell at the same place and then my allowed 4 minute time frame was up. I wasn’t strong enough to push myself up. Too bad I didn’t think of an alternative solution. This cost me my leading position, but I am still proud of my 3rd place. Elfe became 2nd and Magalie 1st. 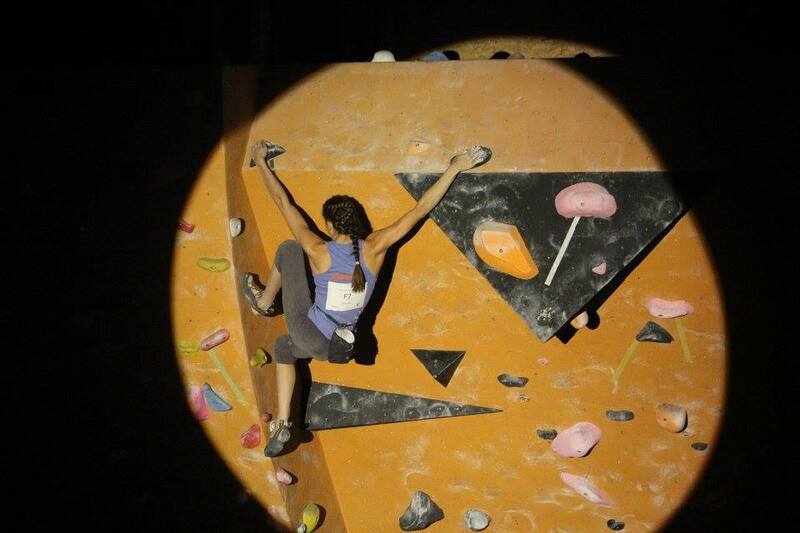 It was a nice competition with fun routes and the atmosphere was fantastic. 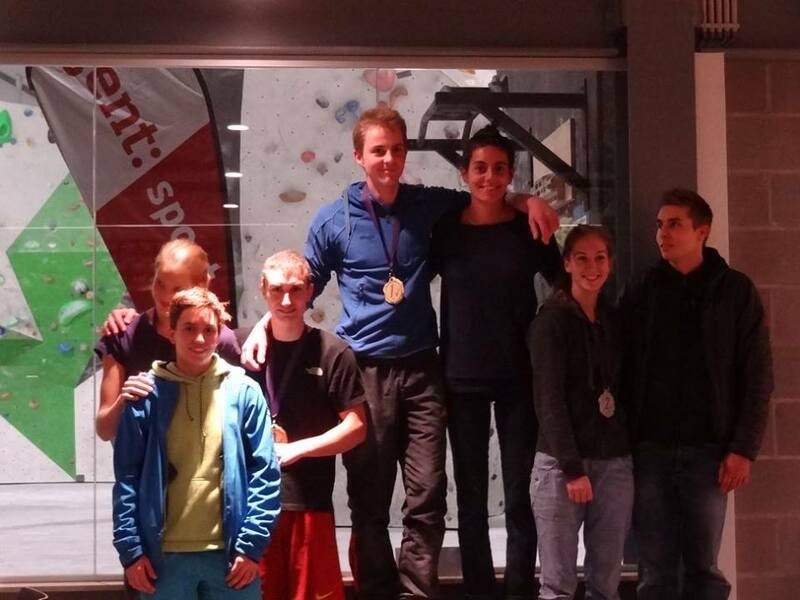 The weekend before, there was a bouldering competition in Biover. Biover is a new climbing hall since a year ago. Before that we had to go to Bleau, a small but very cosy boulder gym, also in Ghent. The competition lasted from 7 p.m. to11 p.m. and the podium was at midnight which is very late. I personally didn’t like the routes. 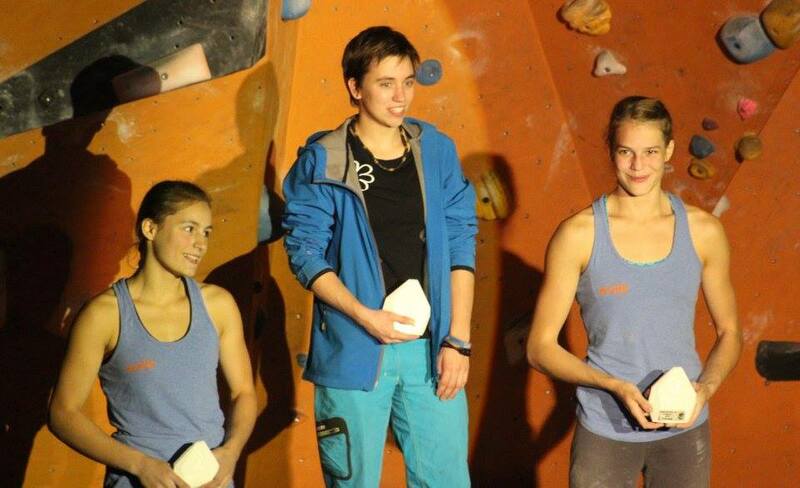 They required too much power and it was a pity that only the ten hardest problems were overseen by judges and the girls didn’t even get there, but we had lots of fun and I ended at a tied third place with Magalie. Before us were 2 girls from France. The podium however was turned around, so the 3rd place was on the left hand side and the 2nd place was on the right. People afterwards thought I was 2nd because of that error.